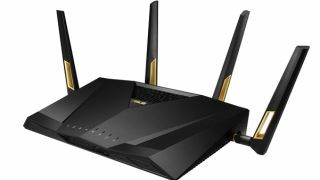 The Asus RT-AX88U is the latest router to support the latest Wi-Fi 6 (802.11ax) standard, with the technology – which is expected to become widely available in 2019 – promising big things for home Wi-Fi networks. The latest 802.11ax Wi-Fi standard brings support for 160MHz bandwidth and Wi-Fi speeds of up to 6,000Mbps to the Asus RT-AX88U, with speeds of 1,148Mbps on the 2.4GHz band and 4,804Mbps on the 5GHz band. This is 2.3 times faster than current 802.11ac dual-band routers. Asus has also packed the RT-AX88U with some powerful networking tech, including OFDMA and MU-MIMO technology that Asus claims provides up to four times better network efficiency and capacity. If you have a home or office with lots of devices connected to Wi-Fi, then the RT-AX88U could make a big difference. According to Asus, the RT-AX88U provides up to 80% greater coverage than previous-generation routers. The Asus RT-AX88U also comes with eight Gigabit LAN ports for wired devices, plus two USB ports for connecting hard drives and printers and sharing them with the rest of the network. It features a 64-bit 1.8GHz quad-core processor, plus all the network features we’ve come to expect from Asus routers, such as QoS for prioritizing gaming traffic and support for Asus AiMesh, that allows the router to connect to other compatible routers to create a mesh Wi-Fi network. The Asus RT-AX88U certainly appears to be a forward-thinking and feature-rich router, and we’ll hopefully get to try it out soon. It’s available to buy right now for $349.99 (around £280, AU$500).